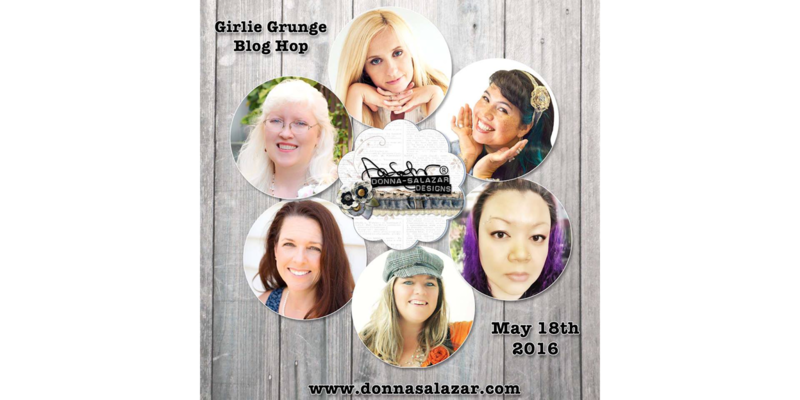 Hello and welcome to the Donna Salazar & Friends Girlie Grunge Blog Hop! We've arranged this hop to showcase all the new and exciting products that have recently been released from both Scrapbook Adhesives by 3L® and Spellbinders®. We are sure that you will enjoy the projects that all of us have created for you AND... we've got PRIZES!!! The Donna Salazar Designs Prize Pack has a Denim Art Journal, Girlie Grunge Twine and Silver Pigment Powder from Donna Salazar with Scrapbook Adhesives by 3L® and a Jumbo Rose Steel Rule die from Donna Salazar Designs® with Spellbinders®. 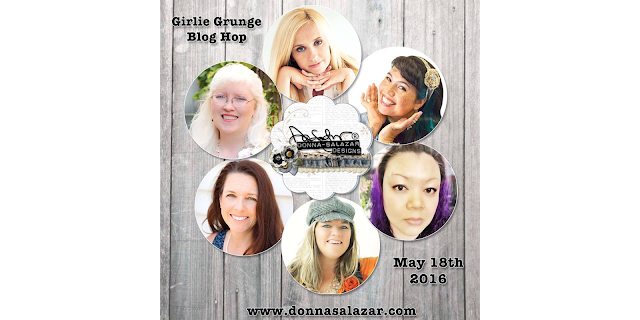 There are several ways to enter: You can leave a blog comment, Tweet about this blog hop and visit the Donna Salazar Designs Facebook page BUT signing up for a FREE membership on DonnaSalazar.com gets you the MOST entries!!! The contest opens at midnight on May 18th and closes at midnight on the 25th. I created a 9x12 canvas using a whole bunch of fun Donna Salazar products! This chipboard dress form was altered with Donna's Jasmine Mix'd Media Inx and Brown Pigment Powder. I then made a skirt using Girlie Grunge Gauze and added Lace Ribbon to the waist. The gorgeous wings were cut with one of Donna's new dies - Art Doll Accessories. So pretty! I added a bit of Girlie Grunge Gauze behind the wings for a more whimsical effect. The large flower shown here is hand-made from a mix of Donna's Jumbo Rose and Rose Creations dies. The Jumbo Rose die is a steel rule die so you can cut denim and loads of other fabrics with it! Endless possibilities! The smaller blooms were made using Donna's Bitty Blossom dies... one of my ALL TIME favorites. I adhered a die cut from Donna's Cascading Butterflies die to the background of my canvas. The flow of the butterflies helps bring the eye down the canvas and adds a unique pattern to the piece. What I love about this die is that you can use both the outline of the butterflies and the actual butterfly die cuts! It's been a while since I have created, and I can't think of a better way to get my mojo flowing than with Donna's products. Hope you enjoyed my canvas! Below are images of Donna's products that I used. Visit all the blogs on the hop today for more inspiration and more chances to win! Gorgeous canvas! You have embellished this piece so beautifully. I especially love your handmade flowers. Thanks for using the new butterfly die, I definitely need to pick that up. Such a beautiful project...detailed and inspirational! SO enjoyed your process and get to see you being creative again because this is FIERCE, girlie!! Loved how you did the dress form <3 Girlie Grunge Gauze behind the wings - light bulb moment! LOL!! Beautiful I love how you used the butterfly die on your project! Very nice work ! Flowers , butterflies - blooming beautiful garden ! I love the color palette and flowers. Just lovely. OH MY, it is a DELIGHT to the eyes and heart, such GORGEOUS colours and dimension, such a WONDERFUL design, the flowers are an AMAZING extension of the patterned paper - LOVE IT ALL!!! OMW....this took my breath away.....just BEAUTIFUL!! Such a beautiful card. Outstanding job!